Goodbye Blaugust, hello Restember! Well hopefully not. Yesterday marked the end of another successful Blaugust. Thirty-one posts in as many days. Unlike last year when I apparently hit a speedbump after the first week, this year I didn’t start to struggle with topics until around the 12th or 15th. Even then, I just stopped worrying about having a topic and just started writing and figured a topic would show up. Some times it did. Some times it did not. That for me, was really the point this year. I basically relearned last year’s less of “just write and publish” don’t worry “is it ready.” That’s not to say I published anything I wouldn’t normally publish, it’s more that I would’ve just not sat down to write or I would’ve saved it as a draft thinking I needed to come back and proof it, and then deleted it three months later. My favorite thing about Blaugust this year besides just getting back in the habit of writing, has been the success of my multitasking experiment over the last week and a half. 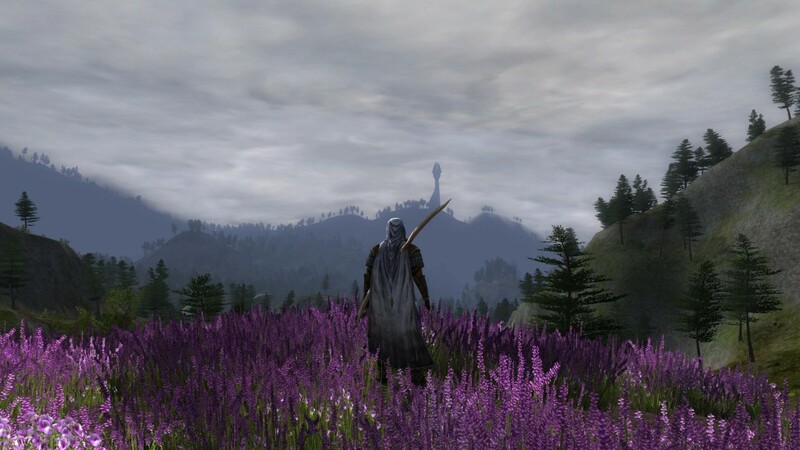 Needing something to write about daily, and having a bout of nostalgia for a couple of games that I always mean to get back to, gave me the push I needed to finally pick LotRO and Champions back up. Even better is the fact that I’ve seen other people get interested in those games as a result of posting about it here. Last year, I trailed off in September posting eleven times in the first half of the month. Then only twice in October and nothing until January. Unfortunately, it seems like if I’m going to be consistent, I have to do it every day. That certainly has been true for Blaugust, and was also trued for me during Nanowrimo. But daily blogging full-time feels like a huge commitment. Weekends especially are difficult to make sure I sit down and write. It might be enough if I schedule a daily task in my organizer that just runs Monday to Friday, but I think that’s what I want to try starting out, along with a reminder to check in on the blog and see how I’ve been doing after a few weeks. My multitasking experiment has hit a speed bump. It’s hard to rotate through three MMOs when two of them are having connection issues. According to the Neverwinter community manager, Cryptic is having an issue with their ISP. As someone whose been on the phone with Comcast twice in the last seven days and having a technician come out Thursday to check the wiring both inside and outside, I can sympathize. At least they’re taking care of players and extending active events. I didn’t play any games last night. Yesterday’s Golem Arcana write-up took longer than I expected, and I burned quite a bit of time on YouTube and Reddit, but I did get some LotRO in on Sunday that I didn’t mention in yesterday’s post. My return to Middle-Earth had made Wininoid nostalgic, and we got together with a pair of low level characters (Loremaster for him, Champion for me) and completed the post-tutorial quests in Comb. I hadn’t done any of those since the last revamp was done. I don’t expect I’ll spend a ton of time on alts though, as my main goal in LotRO for the multitasking experiment is to get my hunter, Brynulf, back to the level cap, and more importantly experience Isengard and Rohan. Tonight’s plan will be to check in with STO and Champions and see if I have any luck. I’d at least like to review my completed duty officer assignments and schedule some new R&D projects. Failing that, I’ll probably end up in Kerbal Space Program again. 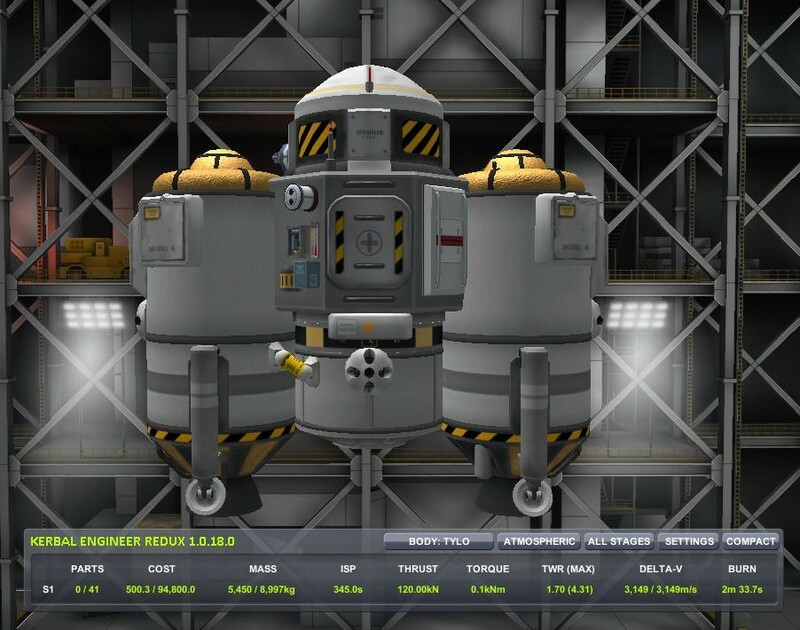 I still have a Jool moon lander to put in orbit and dock with the Kerbol Explorer 1. 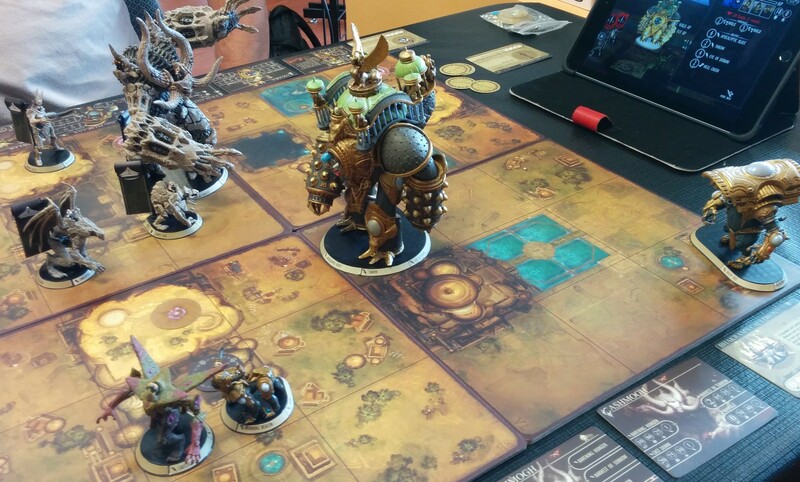 Saturday was my day to meet up with the Indy Golem Arcana group. Only four of us could makes it, which is about half as many people as usually show up, but it was enough to have two games running. We used 100 point armies rather than the usual 500. If you’re not familiar with miniatures war games, every unit has a point cost to it. So game scenarios are usually designed with a certain amount of units in mind, and it also helps to make sure that teams are evenly matched. I had some trouble initially putting an army together since I hadn’t put together a large build in a couple of months. Having a large pool of points to spend might not sound like a big deal, but it can make it harder to build good synergies in when you have a larger number of units. Once I finally got my mental gears switched over though I actually ended up putting two different armies together that I played with. With three Titans (Fen Lord, Wildwood Dryad, and Fend Lord) and three Ogres (all Prowlers), this is a big army. The three Prowlers are so mobile though that I wan’t too worried about getting out maneuvered. I also really liked having three Prowlers in this build since they generally end up destroyed pretty quick, as most opposing players will attack them first because of their Caustic Spray attack and their passive ability which gives them a 5 point damage-over-time for three rounds after they move. Combine that with the two Fen Lords’ ability to pull enemies in and melee, the Dryad’s ranged abilities, and I ended up with a pretty well rounded army and enough points left over for some relics and an Ancient One. This army went up against a Durani build with a couple of Winged Preservers (very mobile Titans), a Jeweled Harpy, and a trio of Fire Rams (think artillery). I ended up losing two Prowlers early on as I wasn’t careful about staying out of range of the Fire Rams. At the midpoint of the match I was down two Prowlers, my remaining one was highly damaged as were both Fen Lords. The Dryad was the only golem undamaged. My opponent hadn’t lost any units although two of his Preservers and his Harpy were heavily damaged. Fortunately for me, the match turned around pretty sharply when I destroyed both of his Preservers before he destroyed one of my Fen Lords. He moved in his Rams to try and get range on the rest of my units, but I moved my remaining Prowler in originally intended to soften them up and then follow up with the remaining Fen Lord pulling out the Rams individually and destroying them in melee. I had forgotten about the special effect on Caustic Spray though. I very rarely get to use it against a group of enemies in the same region, so I had forgotten that the Spray bounces and causes each golem in the region to do 10 damage to every other golem in the region. So instead of doing 8 damage to each golem with a 15 DoT over the following three rounds, I actually did 28 damage plus the DoT. Rams only have 60 hit points to begin with and I had gotten in some attacks early on so all three were reduced to 4 hit points and then died at the beginning of my opponents turn. That was basically the end of the game. I did have to contend with his Warsprite Harpy, but with two Titans and an Ogre remaining it was quickly over. 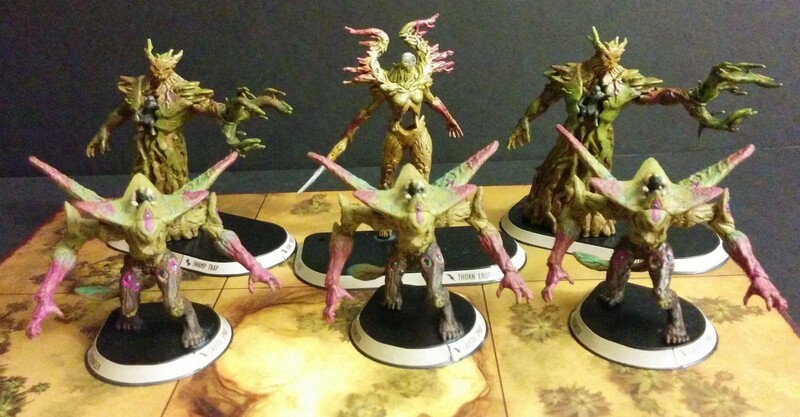 The Ashmogh Colossus in the back, then left to right in the front are the Corpse Collector (Ogre), two Crypt Ticks (Warsprites), and the Morrow Witch (Ogre). 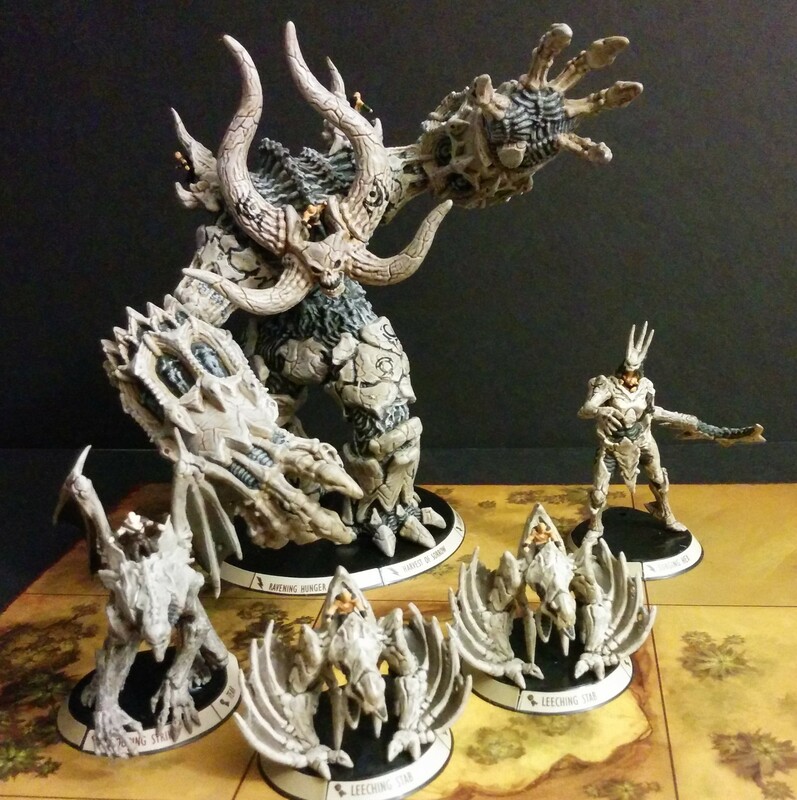 The Ashmogh is the newest Colossus released for the game, and one of the reasons why the group wanted to play 1000 point armies. I basically threw this one together by picking the Ashmogh and most of the units from the most recent Urugal release. I left out the Relentless Brute (Titan) since it’s a melee powerhouse which I didn’t need with a Colossus on the field. Instead I went with a Corpse Collector because it was more mobile and had a nice ability to drag enemies to neighboring regions. My Urugal army went up against a Durani army containing a Jagara Colossus, one Titan a Growling Phalanx, two Ogres a Prowler and a Fire Ram, and one Warsprite Vigilant Sentinel. With two Colossi on the field, this turned out to be a pretty long match. I started out with a really nice combo by using a relic on my Morrow Witch that added 10 regions to her range, and which let her use her ranged attack, Surging Hex, all the way across the board. Surging Hex is a damage-over-time attack that does no damage initially. Instead it does 5 damage the first round, 10 the second, and 15 the third. Even better, unlike most effects, this one stacks, and I hit his Jagara with it three times. So the Witch’s hex did 15 damage to the Jagara on my opponents first turn, 30 on the second, and 45 on the third. That’s 90 damage against the Jagara’s 250 hit points. The next round my opponent led by bringing his Prowler across the board to get some early Caustic Sprays on my army, and I countered on my second turn by pulling his Prowler in with my Corpse Collector and bringing both Ticks in for melee. If I hadn’t missed, I would have been able to destroy his Ogre with their healing attacks, but sometimes the Random Number Generator likes me and sometimes it doesn’t and early in this game it definitely did not. I ended up losing both Crypt Ticks and the Corpse Collector in the first half of the game, while my opponent had only list his Fire Ram. But all of his other units were heavily damaged between the Ashmogh wading into the middle of the combat and the Witch staying at the edges and throwing out Hexes. Usually Morrow Witches are the only units with a bigger target on their backs than Prowlers because their DoT is so nasty, but my opponent was so focused on my Ashmogh that she managed to hang around for most of the game and I think that made the difference in my win. This was a tricky army for me to play. The Urugal faction is powerful but most of their abilities are fueled by sacrificing hit points, which is counter to my normal play style. This was also the first time I had used the Morrow Witch or the Crypt Ticks in a real match. Surprisingly to me, I think I played better in this match than the previous one as I didn’t have any unintentional good moves like the one I pulled with the Prowler against the Fire Rams. I think because I’m not as familiar with Urugal as I am with Zikia, I’m more careful and pay better attention to what abilities I have available. I had planned to spend last night’s gaming time in Champions Online, but the patcher was running extremely slowly, so instead I tried Star Trek Online and it timed out on the character loading screen. Cryptic seemed to be having some kind of network issues, although I didn’t try Neverwinter to see. Instead I took it as a sign to go play more Kerbal Space Program. In Kerbal, I decided I’d messed around with the planning stages of my Jool mission enough. 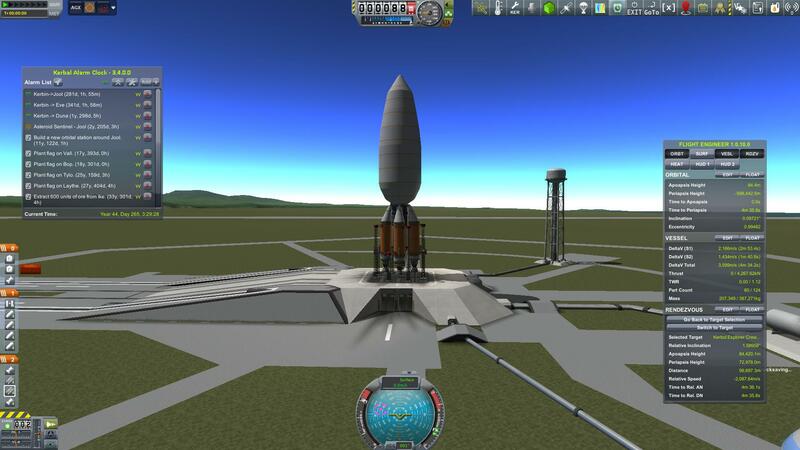 It was time to start launching rockets. 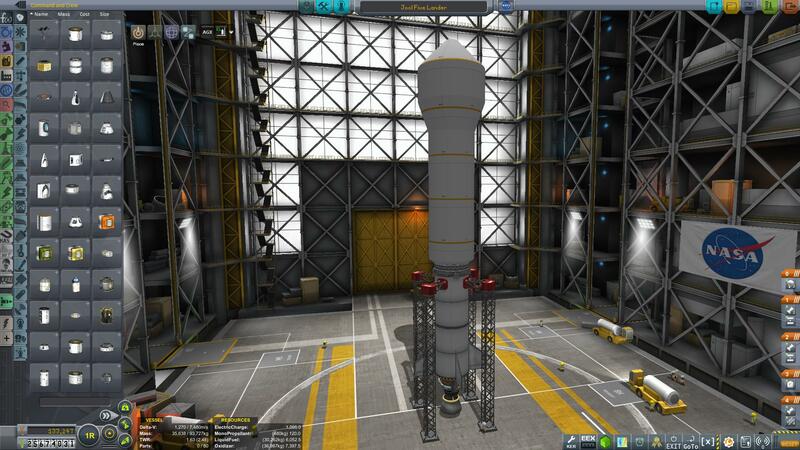 I started with the crew module for the explorer ship. 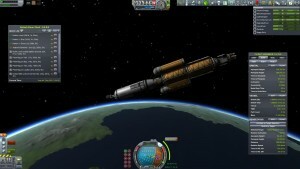 I figured that way I could rendezvous with the hydrogen tanker, dock it, and then dock the engine module with out having to do and undocking and rearranging. I took me three tries to get the launch right. I ended up having to go straight up more than I wanted before turning the ship, so I used more fuel getting into orbit than I planned on, but I still have enough fuel remaining to rendezvous. Docking also turned out to be quite challenging. 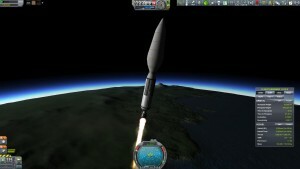 I used more than 60% of my mono-propellant getting into position and closing the remaining distance. 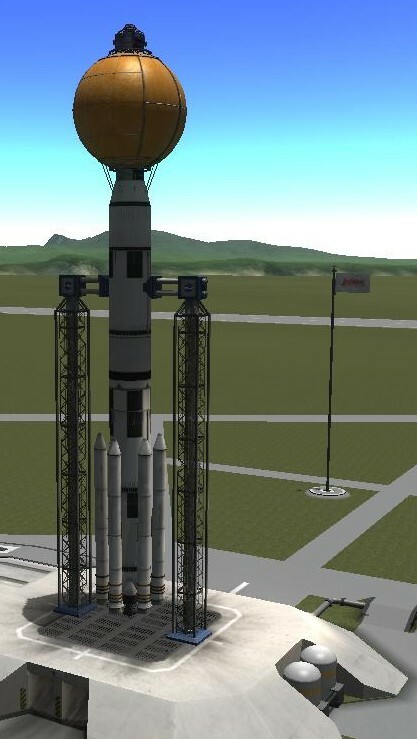 A lot of that was due to the mass of the vehicle compared to the reaction wheels and the fact that I didn’t include RCS at the base of the rocket. All of the thruster blocks were on the crew module. I also made the whole process harder by launching when the hydrogen tanker was on the opposite side of Kerbin, so it took quite a few orbits to catch up with it. 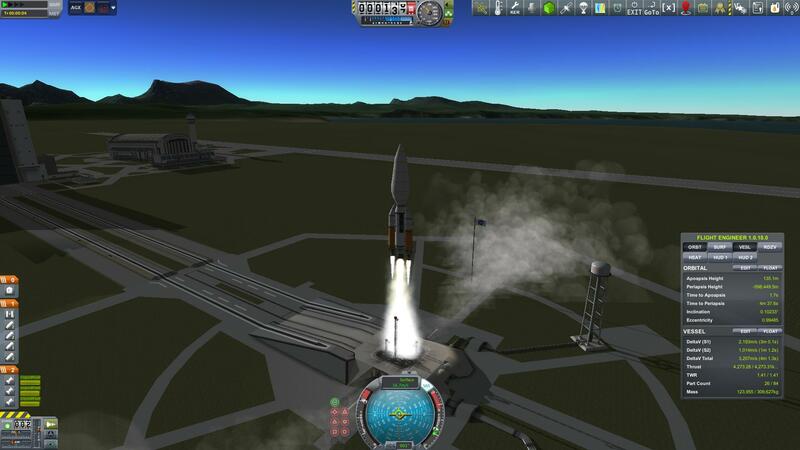 The engine module launch when much smoother. The total rocket mass was a bit heavier (387 tons versus 316 for the crew module launcher), but I added extra fuel and engines to the initial stage to compensate and account for a less efficient ascent path. I also saved myself a lot of headaches and waited until the hydrogen tank and crew module were nearly overhead before launching, so I wouldn’t have much work to catch up. I only needed one try for this launch. I actually managed a better ascent path as well, although I did still end up in a high orbit than I wanted to. But it didn’t take much fuel to correct that. You can see from the third picture with the fairings off that I sent the engine module up backwards. I wanted to keep the engine and reactor weight at the top of the rocket to help with stability (think of a dart if that’s confusing), and the large docking port that would eventually couple to the crew module was a strong spot to attach to the launcher. 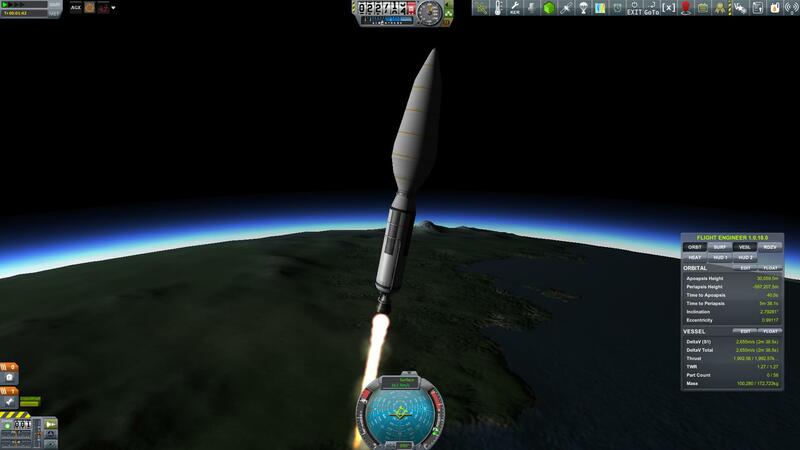 Rendezvous was very easy this time since I’d made a better choice on launch time. Docking was also painless, especially compare to the crew module, since the engine module was empty of fuel and only 31 tons where the crew module was fully stocked with supplies and 72 tons during docking. After completing assembly of the explorer, I transferred hydrogen from the big tank over to the ship. I was able to fully fuel the explorer and still have 66% of the big tank left. 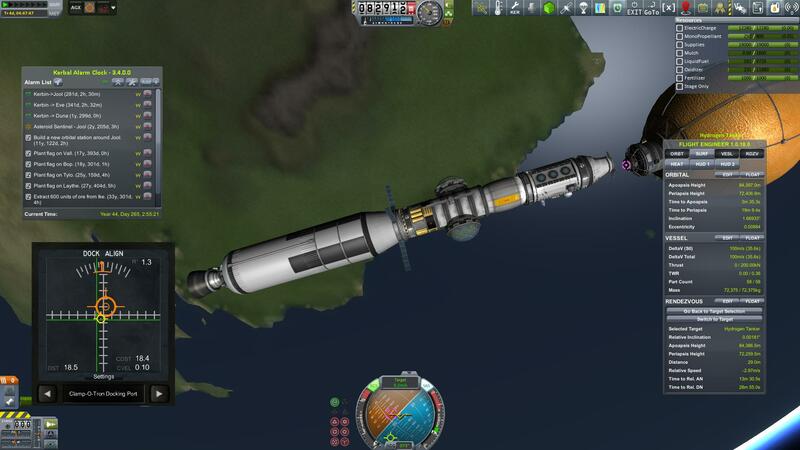 The tanker will stay in Kerbin orbit awaiting the ship’s return from Jool where it can refuel for a return voyage or a mission to one of the other planets. My next play session, I’ll send up the lander vehicle and get it docked to the explorer. It’ll attach to the nose with the hydrogen tanker is currently docked. I’m a little concerned about the thrust-to-weight ratio of the ship once I do that. 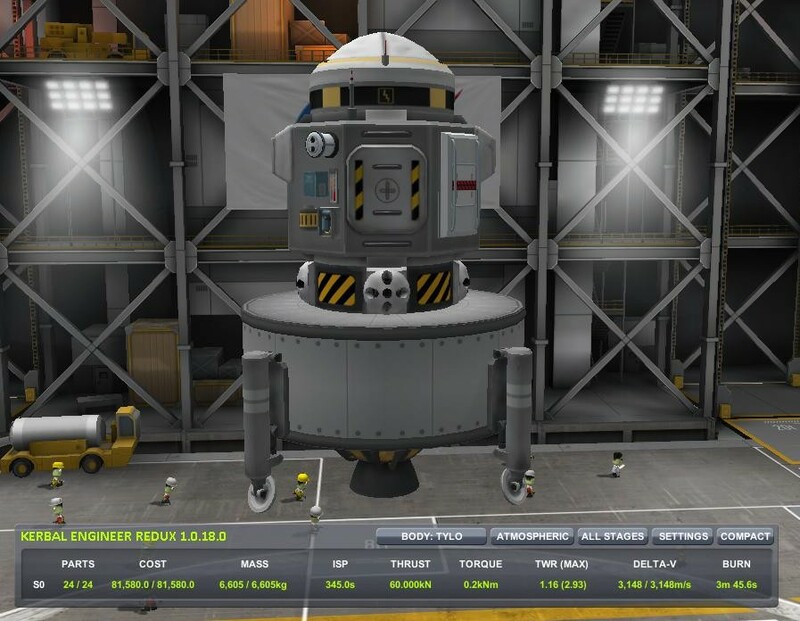 If it’s too low, I’ll have to make a different transfer vehicle attach to the lander and send it out to Jool ahead of the Kerballed mission. In testing it looked like it would be okay though. 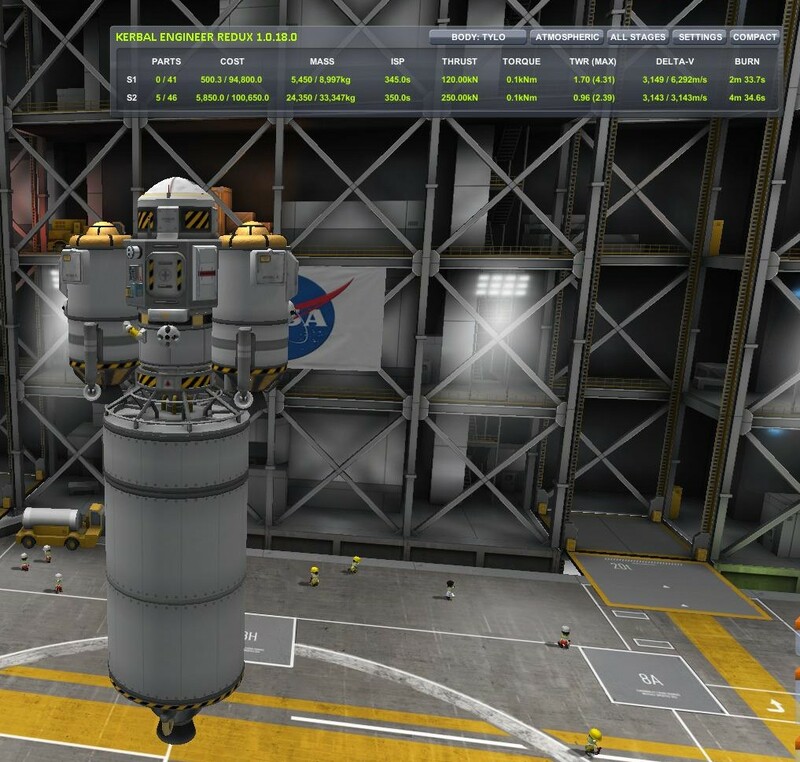 There are about 280 Kerbal days remaining before the transfer window, so I have plenty of time to finish assembly and send up the crew. I played Kerbal Space Program last night and spent a couple of hours fine tuning and testing my lander and explorer ships designs as well as planning out the launch sequence and orbital construction process. 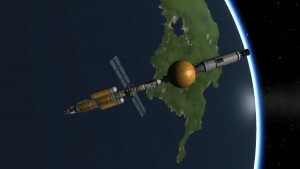 My current plan is to put the lander up one it’s own, followed by the crew and engine halves of the explorer ship. The engine module of the explorer will be empty of fuel, in fact I’ve already managed to launch a massive spherical tank of hydrogen fuel into orbit in preparation. I pretty much just threw this together and brute forced the launch, but I wanted to put something into space. Once all of the pieces are in orbit, then I’ll rendezvous the two halves of the explorer ship with the fuel tank and assemble the ship and transfer as much hydrogen as it will handle. Then, I’ll deorbit the left over launch vehicles and bring the lander craft in to rendezvous and dock nose to nose with the explorer. The last bit will be to send up a crew shuttle once the Jool transfer window gets close. 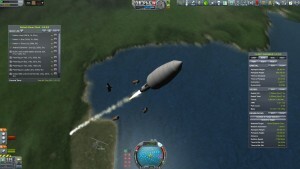 I have the lander contained in a fairing now with enough of a launcher to get into orbit. I’ll use the lander’s existing fuel and engines to dock it with the explorer ship, which will be carrying fuel to refill the lander anyway. Before I package up the explorer craft, I wanted to make sure I had the fission reactor and VASIMR engine set up correctly. I’ve not used either on a mission before and I didn’t want to have problems with heat before I even left the Kerbin system. 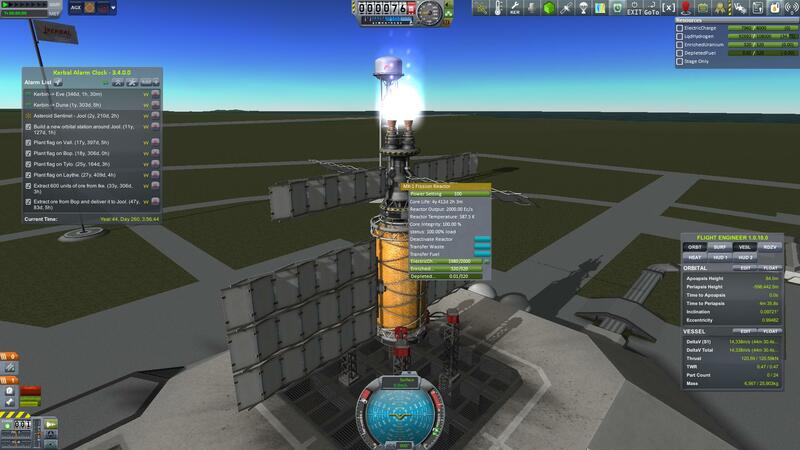 So I set up a test using a stripped down version of the engine module and let it run for fifteen minutes. I’m glad I did because my original thermal system had some issues and needed tweaking. Unfortunately it turned out to be 1 am before I noticed so I had to stop there. I’m getting close though. I need to get launchers set up for the two halves of the explorer ship and then it’ll be time to start putting stuff into orbit for assembly. It’s exciting but nerve wracking as well. I keep double checking things to make sure I haven’t made any mistakes or forgotten a part. I really don’t want to have my three Kerbals arrive at Jool after a two year trip and realize I forgot something stupid. I played LotRO last night, continuing my multitasking experiment. I nearly cut my play session short though as the next quest I picked up after completing some small errand quests involved a solo instance required me to help four NPCs defeat multiple waves of enemies for 8 minutes. By about 2 minute remaining mark, all of the NPCs were usually dead and my Hunter would be overwhelmed shortly after that. After three attempts I almost stopped for the night but I decided to give it one more shot and barely managed to finish the quest. It was so close that I actually thought I’d failed it again. I didn’t realize until I attempted to talk to the quest giver to reenter the solo instance and got the completion dialog instead. The cool thing though was that quest was the last one for the current area. I had one last quest which involved riding to a different area and talking to an NPC and then riding back, I’d forgotten how much of that type of busy work was in LoTRO, and then it was off to the south into the Gap of Rohan. More specifically to the Heathfells which are beautiful. I’m pretty sure that’s Isengard in the distance, if so it’s my first sighting. The Gap of Rohan outlines three different regions, so I doubt I’ll get to Isengard quickly unless I decide to skip content. I have time though. 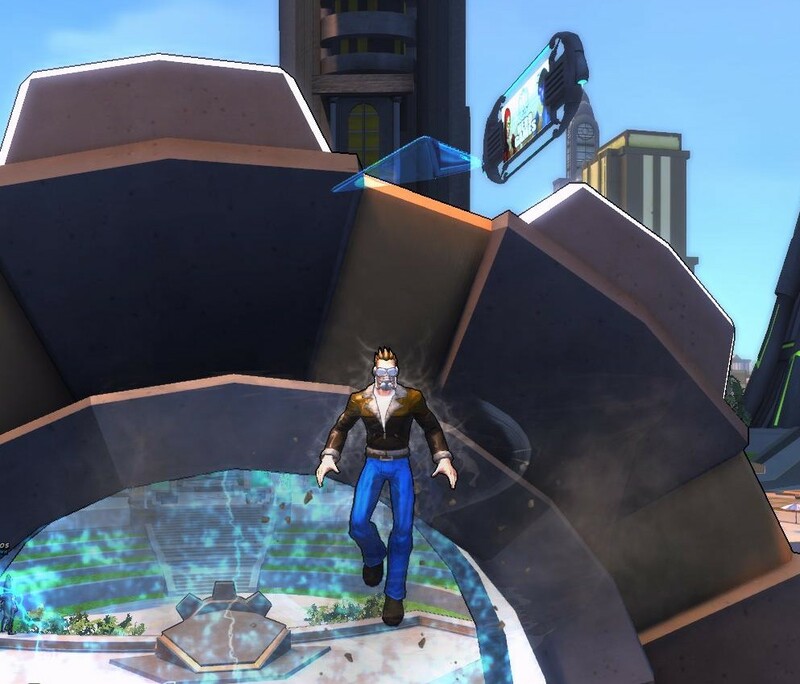 Last night I got back on track with my multitasking experiment and logged into Star Trek Online. I loaded the game in the middle of a fire fight which made for an exciting start to things. I had forgotten I was in the middle of the Kobali ground combat zone when I was disconnected because of a Comcast outage. So once my away party had dealt with the immediate threats, I set about finishing the remaining missions. I had four or five left but I did finish the Kobali ground missions finally. I’m a little late the the party on completing those as they finished with a teaser for the featured episode, Dust to Dust, that came out back in February. Still it was quite fun, although I don’t think my Captain, technically Admiral, and officers were well geared for Vaadwaur combat. They died quite a bit, which doesn’t normally happen. Between finishing up some missions and the steady stream of XP coming in from duty officer assignments, Bryn is nearly level 59. I imagine he’ll be maxed out before hitting the end of the Delta Quadrant content. I hope to have everything finished before the next major release, Season 11, comes out. There’s been no official date announced yet, but I’m expecting sometime in October. I’m excited to see a more hopeful story line emerge. I didn’t play any games last night. Instead I had a nap, caught up on some YouTube videos in my Watch Later queue, and went to bed at a half decent hour. Not terribly exciting, but at least I’m not off track on my multitasking experiment. In fact I started that a week ago and I feel like it’s gone pretty well. I only had one cheat day where I played Kerbal two nights in a row, and I managed to hit all three MMOs. I’m especially happy that I got a new hero made in Champions. I saw the following message from Scopique earlier today regarding Legendary Encounters, the Aliens themed board game. And I ask if he’d won yet, he hadn’t, and was he still enjoying the game, he was. Which made me realize that I have different expectations for board and video games. I go into a video game expecting to win, and if I don’t I usually get frustrated after failing a couple of times. Often that will sour me on a game and I’ll stop playing it. Deus Ex and God of War both immediately spring to mind where I hit part of the game that I just couldn’t get past after several tries and I lost all interest in continuing. I go into board games wanting to win, but I certainly don’t expect it. I still sometimes get frustrated, for example I’ve played the Escape from Dol Goldur quest in the Lord of the Rings card game about seven times and not won once, but even there that quest didn’t sour me on the game, I just moved on to playing other quests. I talk often about losing games of Golem Arcana while still having fun, and that’s not unique to that game. I have several board and card games that are quite brutal which I enjoy playing quite a bit, and I’m not quite sure why it’s such a different experience for me versus video games. It’s not the social aspect as I play quite a few board games solo. Sunday night I returned to my multitasking experiment and started up Champions. I logged into the six heroes, I had already created just to refresh my memory on what combinations of powers I had already played with before heading into the character creator and seeing what I could come up with for a new super hero. 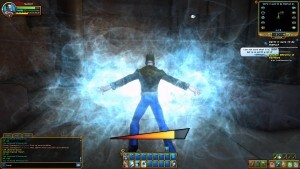 Creating a new hero in Champions, and before it in City of Heroes, has always been a unique experience for me. My favorite heroes, the Blue Ram and Silver Hunter, have always come about because a specific part in the character creator caught my imagination. I started out by picking up some wind based powers, initially thinking I’d create a wizard type character. When I got into the costume creator though as I browsed through different masks and other parts, I happened upon some swept back hair and got the idea for a speedster. A pair of aviator’s goggles and leather jacket started to give me more of an idea on the hero’s background. 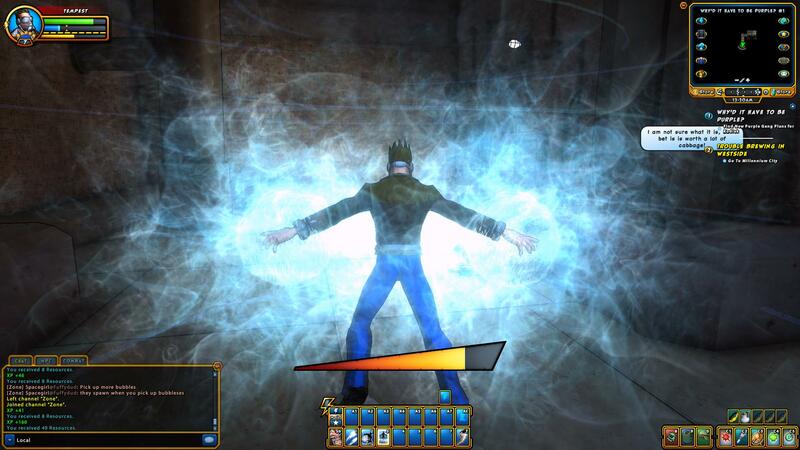 In City of Heroes, the last thing you do is name your hero. It was always the hardest part because not only was it difficult to come up with a name that was cool and fit the character concept, but you also had to come up with something that someone else was already using. More than once, I can remember scrapping a whole hero design because I just couldn’t find a name that I wanted that wasn’t in use. I’m so glad that Cryptic removed that issue by only requiring names to be unique per account. It’s so nice to not have to look up esoteric synonyms. Thus after maybe 30 or 45 minutes, I had created the Tempest. A WW2 fighter pilot who vanished in a storm over Europe before reappearing in Millenium City, not having aged a day and with no memory of the lost time. I took Tempest through the tutorial and first few levels. I had the impression that the starting experience was more changed than it really was from the Ravenswood articles that I’d skimmed on the Arcgames site. The tutorial Qularr invasion is now framed as a simulation of an historic event rather than a live event, and some of the side quests have been streamlined out. It was fun, but I was a little disappointed that there wasn’t more to it. Completely a problem with my own expectations though and not the game. Past the tutorial, you’re dumped into the Powerhouse which avoids an old issue where you ended up in Millenium City first and needed to know where to go. 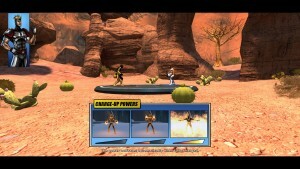 Cryptic has also added some nice training videos, which are in-game cutscenes that explain some of Champions’ mechanics like charge-up powers and maintained powers, and tied the post-tutorial intro quest to watching them. That might sound onerous but they were all very short. Once I got Tempest trained up and exited the Powerhouse, I was directed to Kodiak on the West Side of Millenium City, just like in the original game. I completed the first five or six missions that he gave me and not much seems to have changed there. It all felt very familiar and comfortable. Last night should have been my return to my multitasking experiment, and playing anything other than KSP which is what I’d played on Wednesday. But I had just watched the latest trailer for The Martian again and was in a space mood that Star Trek Online doesn’t really fulfill as it is more science fantasy and hard science. Instead I headed back into the Vehicle Assembly Building to work on the next stage of my Jool exploration mission. 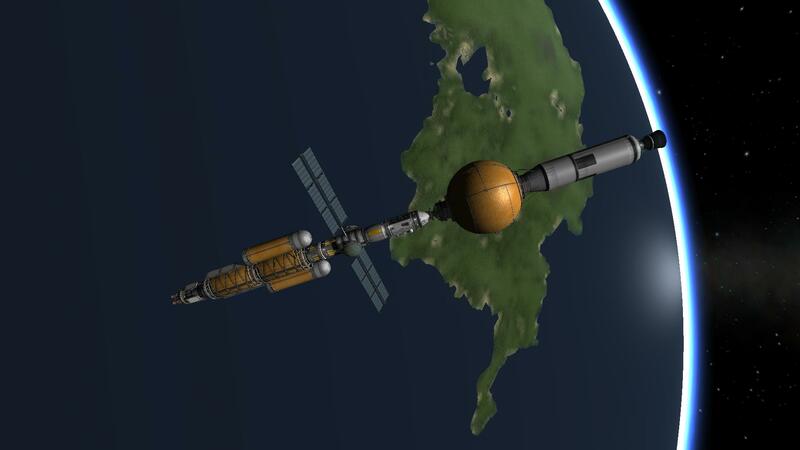 My previous design work had been all about building a craft which would take three Kerbals from Kerbin to Jool and allow for refueling at an automated refinery I’d already place at one of Jool’s moons. But I still needed to build a landing craft to take along. After all it would be a waste for three Kerbalnauts to spend years traveling out to Jool and not get a chance to plant flags on at least one of the moons. I’m actually planning something more ambitious than that, which is called a Jool 5 expedition. Basically, landing on all five moons with a single mission. Something that was much more challenging before Squad added ISRU (in-situ resource utilization) equipment to the game, so now it’s possible to set up refueling locations. Even knowing I can refuel though, I needed to design a lander that could handle landing and taking off from all five of Jool’s moons. Some like Bop and Pol are relatively easy. Both are small, low gravity satellites, and have no atmosphere. Vall is bigger but not too difficult. Laythe is more of a challenge. Its gravity is 0.8 that of Kerbin and has an atmosphere like Kerbin does which will help with landing since I can plan to use parachutes not burn a ton of fuel to land. The real challenge of the five will be Tylo. It also has a gravity 0.8 times Kerbin, but it has no atmosphere so the entire landing will require fuel, which means twice as much as will be needed for Laythe. I had a basic stage for the Tylo descent, but was trying to put together an ascent module that would also work for Laythe and the other moons. This is my first design. To take off from Tylo I need better than 1.0 TWR (thrust to weight ratio) and at least 3070 delta-V. The only problem is I don’t like the look of the big tank sticking out. I started over and played around with some other ideas. The problem was that using more smaller tanks meant more weight for basically the same amount of fuel, which meant a bigger engine or more engines. Which is not horrible, but anything that could take off from Tylo would be way over engineered for the other moons. 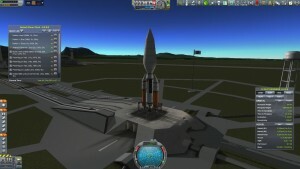 And I’m expecting to reuse the craft for Bop quite often after completing the exploration mission. I finally settled on the following design. Not only do I like the look of this craft better, it actually has better TWR and a 1 more meters per second in delta-V. So now that I have my landing craft, I need to revisit my exploration ship. The current ship uses nuclear engines which run on liquid fuel only, whereas the motor on my landing craft requires LFO (liquid fuel and oxidier). So I’ll need to add a tank to the ship to allow refueling of the lander after it leaves a moon an docks. That will of course mean I need to adjust the fuel and motors on the exploration ship as well. It’s a lot of planning but that’s part of the fun of the game for me. Here’s the completed lander with the Tylo descent module.